Because they suffered damage to their main church building in the fire on Pascha morning, the services will be held in their Parish Hall. 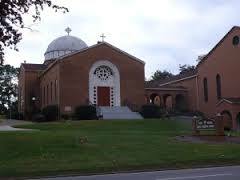 St. George is located several miles from the University of Tennessee Campus at 4070 Kingston Pike, Knoxville, TN 37919. Note that because Fr. Job will be serving Vespers with Fr. Anthony at St. George on Wednesday evening, we will not be having our regular Wednesday Vespers at St. Nektarios.